Winter can be colorless. No green grass, all the leaves have fallen, the sky stays a dreary gray threatening with snow. So I’m giving it color. Well, the blog color. The hubs was extremely thoughtful yesterday and sent a bouquet of flowers to work. Stargazer lilies and roses. 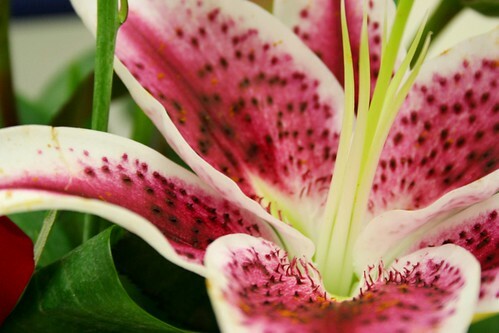 I love lilies. And stargazers? Well, they top the list and smell so sweet. And are full of color. Bright pinks and greens and white. Lovely. I had a wonderful birthday – thank you for all the wishes. I had lunch with my parents and PodMate got to see with her own eyes how ridiculous they are [and why I love them]. The peeps I work with had an icecream cake. With Reeses Cups on top. Can we say nom? Yes we can. And the hubs and I piled all our blankets in the living room floor, snuggled with the doggins, munched on pizza, guzzled down beer and watched The Half Blood Prince and Zombieland. Sorry, Harry Potter, but the zombies were way more entertaining. And then we ended up crashing there, on the floor, with the dogs between us. It was an excellent evening. Tonight, I plan on busting out the cake the hubs tried to surprise me with. Which happens to be an icecream cake with Reeses Cups on top. What? I’m not too hard to figure out. 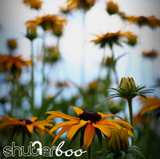 ~ by shutterboo on February 13, 2010. The contrast in these photos are excellent. You can really capture the depth in the petals. beautiful, just beautiful! alas! you’ve inspired a post. So glad my son came thru with the beautiful flowers. 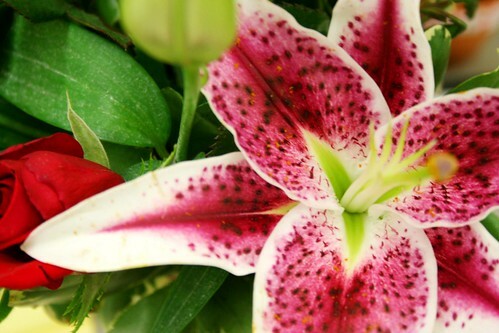 Stargazers are the most aromatic of all the lillies. You’ll have to get some day lillies from me this spring. If it ever gets here again. . . .